I am loving this summer so far. Now that I have a blender that works (smoothies, smoothies, smoothies!) and I have all your great summertime meal ideas, I’m set! I’m going to start trying all your ideas this week. Thank you! 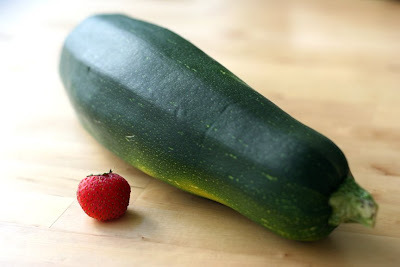 And if you have more summertime meal ideas, please go post them here! I can’t wait to try the rest of the recipes you shared…but only so many days in a week! Thanks again everyone, and I’m excited to see what YOU are eating this week! I’ve done it. I’ve planted a garden. If you know me, you know I have the blackest of all black thumbs. But I’m bound and determined to make this garden work. I only planted perennial flowers to keep it simple, but I did put a blueberry bush in. Yesterday I was able to pick the first handful of berries. PS…I’ve said it before, but aren’t blueberries just the prettiest? Free Giveaway! 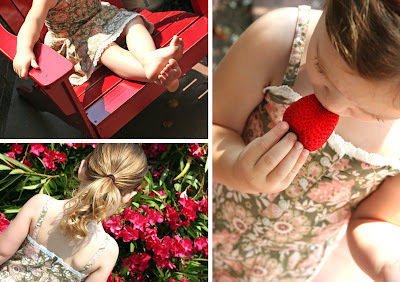 Shabby Apple Dress! Today’s giveaway is fun fun fun! Looking for a great dress for the summer? Look no further! 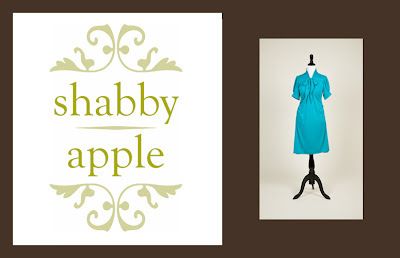 Shabby Apple is giving away their 90 Words Per Minute dress to 1 lucky TWFD reader! It’s in a great, fresh color for the summer and comfy to boot! I only wish I could win this thing…it would definitely kick up my “cool” factor a notch or two (or twenty). You men out there should enter this giveaway, too…your wife or girlfriend would be mightily impressed if you gave her this dress! I know, I know, the giveaway isn’t food related. But I knew you would love it anyway…AND the name of the company has a fruit in it. So, it’s a food giveaway after all! Shabby Apple is also offering a 15% discount on your orders between now and August 24, 2008, so get shopping! The coupon code is SAMarketing15forJane. …and HEAT, which generally sends my weekly menu plan into a tailspin. When it’s hot, I just can’t stand thinking about cooking over a stove or turning on an oven! 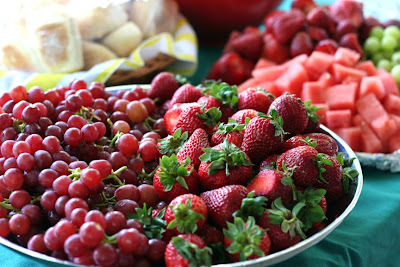 Please share your favorite summertime meals with us! 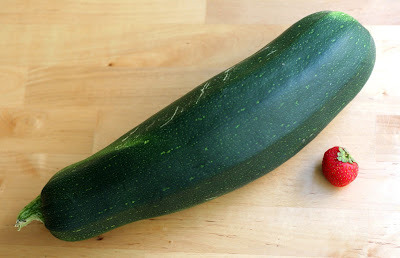 Whether you like them because they’re lighter for eating, don’t require as much time spent slaving in the heat (ovens, stoves, etc), or it’s just something that always reminds you of summer, I want to know about it! And so does everyone else. Which means summertime has also brought you a bit of homework…get posting! I want to give you all a summertime A+. 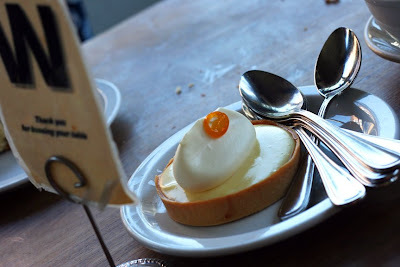 One of our first weeks here in the Bay Area we went to Tartine Bakery in San Francisco. It was AWESOME. I took so many great pictures and have just been waiting for the day when I have time to write up a good entry about our visit. I still haven’t done that, so I’m just going to tease you with one of the photos today. I promise to share more Tartine with you soon! Bring on the menus! I’ve said it before, I’ll say it again…I love seeing what you are all cooking every week. Being able to browse your menus/recipes for ideas every week is such a huge help. THANK YOU! We decided to take Cate to a movie since it was going to be a hot day. Because I’m cheap, I decided to pop some microwave popcorn and sneak it into the theater. Popcorn only takes about 2 1/2 minutes in our microwave, but I always set the time for 4 minutes so that it doesn’t end early and I can take it out at the RIGHT moment. And I’m good at microwave popcorn. When I’m paying attention, that is. 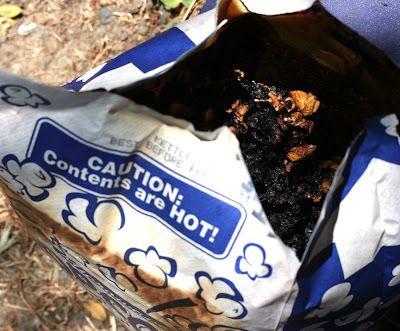 For whatever reason, today I put the popcorn in the microwave, hit “Start” and then LEFT THE KITCHEN. Then my phone rang and it was my wonderful sister-in-law, so I chatted a bit with her. Then I went in the kitchen for some water. Yeah, not the popcorn that had, at this point, been cooking for 3 1/2 minutes. But the smell reminded me why I should be in the kitchen (see below for picture). So, now we don’t get to go the movies because I need to keep all the doors and windows open for the next two years or so. And it’s so HOT today. My microwave STINKS. My kitchen STINKS. My house kinda stinks. Not like popcorn. More like I just burned the house down. Any tips or pointers? I’m scared to use the stinky microwave, which is now stained yellow inside. Fun. Seriously, besides airing out the apartment with hot air, is there anything else I can do? I like to think this experience has no reflection on me as a person (i.e. distracted, forgetful, DUMB) or a cook (I mean, who screws up microwave popcorn THIS bad?) but rather vindication from the Movie Theater Gods who were angry with me for planning to sneak food into the theater. Yup, I’m pretty sure that’s why this happened. CAUTION: Contents are ON FIRE!!!!!!!!!!!!!!!!!! Today’s featured recipe is EASY and DELICIOUS. That’s about all I have to say about it. If your chicken breasts are frozen, no need to defrost – just place them in your baking dish. Sprinkle the entire Onion Soup Mix over the top then pour the Russian Dressing and Apricot preserves over the top and kind of “mush” it all together with a spoon. 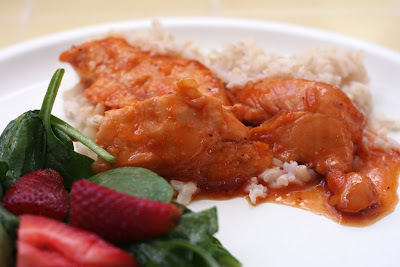 - I rarely cook 4-8 chicken breasts at once”¦but this makes enough sauce for that much chicken. I just do 2 breasts and have lots of leftover sauce. - I mix the onion soup, russian dressing and apricot preserves with a spoon in the casserole dish and then add the chicken. - I don’t use the entire onion soup mix packet – I like about ½ – ¾ of the packet. Just a personal preference. - You can just add half the apricot preserves if you have an 18 oz jar. Half the jar is about 1 cup, and you won’t have to wash a measuring cup. One of the reasons I love this recipe is because there are no dishes to wash except the dish it cooks in!! Book Club…for the writers and wanna-be-writters out there! Book Club time! For those of you who like to read and/or write, today’s books are perfect for you as they are are both about writing. If you are an aspiring writer, enjoy reading about the craft, or just like good writing, you will enjoy these books. Today’s post is long…so, please click through to read it all. It’s a good post, I promise! The books are amazing. Plus, if you stick through to the very end you get to hear about my most embarrassing, awful moment as a mother. You don’t want to miss that, right? Click here to continue to the post and see the books! Writing Motherhood is the other book I’d like to share with you. The author, Lisa Garrigues, is a writer and mother herself and teaches a course also called Writing Motherhood. The book is great. A very enjoyable read and full of awesome ideas. It definitely makes me more excited to write about my experiences as a mother. I really think any mom (or dad!) would enjoy this book, no matter your interest in writing. New Jersey Moms Blog is “hosting” a book club today for Writing Motherhood. Be sure to go over and share your own experiences, as well as read everyone else’s! Plus the author is commenting and participating as well! el literally rolling in the water. I will never forget that sight as long as I live (I can’t believe I’m even admitting to it publicly!). Thankfully she was in the water only a few seconds and was breathing the whole time. But I felt like the worst mom ever. I didn’t want to tell Nate about it. I did, of course, but it was awful. I have never felt more grateful, blessed and lucky in my life for my story’s end. And the experience definitely made me a better mother. 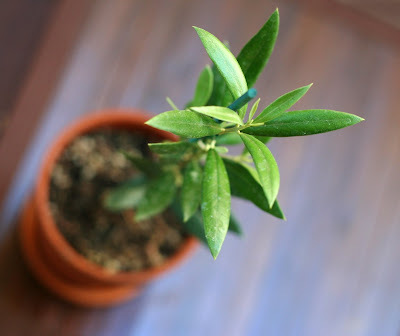 But first, a few of you asked questions about the olive tree that I got from ProFlowers. The answer to all of your questions is “I have no idea.” I am the blackest of black thumbs…I don’t know if it will bear fruit in the pot, if I need to plant it in the ground, etc. My goal at this time is to make sure it doesn’t die in the first few weeks, then I’ll take it from there. If anyone has advice, please share! Congratulations Christie and Lisa! I’m sure you’ll put your $100 gift cards to excellent use! Please email weeklydinners@gmail.com! Thank you to ProFlowers for an amazing giveaway!!! Don’t forget you can still get a 15% discount, even if you didn’t win!